Solo Trip To Peru - Part 3 — NORTH BLOG. With all the adventures so far, I was ready for today. I had been told by a traveller of some hidden rock structures on the outskirts of Cusco that not many people know about, except the locals. Gary the other Scot staying at the farm house wanted to join as he had heard about the structures briefly before. We got a collectivo from Calca to Cusco, getting off at an area called Quinqu. The location we headed for today was a place called Rocas Lancacuyo 'Lancacuyo rocks'. It was very difficult to find and no easy task, but we had our eyes peeled looking making sure that we got off at the right point on the road. Our plan was to get off, explore Lancacuyo then slowly make our way down towards Cusco giving us time to explore Temple de La Luna 'Temple of The Moon' and Qenko (Quechua word meaning Labyrinth or zigzag). Unfortunately we didn't get to make it to these places as Lancacuyo ended up being too much fun! Lancacuyo definitely didn't disappoint. I was expecting some cool rock structures which I did see, but I had no idea I would find an intricate cave system consisting of around a dozen different formations carved in ways I could never have imagined. Myself and Gary saw one of the main openings to the caves, and we both stuck close together at first making sure we never lost one another, then a few minutes in we decided to play a game. We left some money in one of the largest cave sections that we discovered with about 5 different exits leading to other caves. The object of the game was to go adventure all of the other areas, hopefully finding our way back into the original cave and the first one back would buy lunch or dinner. ary kept saying this. I could hear his words echoing throughout the complex cave system, it was hilarious. That sense of adventuring really does bring out the best in people, it's a remarkable thing. The beauty of exploring these caves for me was that I felt safe. I used to be scared of caves when I was younger thinking will these collapse? Will I get lost? Will there be some monster lurking around the corner? But no, these caves felt special, I felt safe and I felt very privileged exploring knowing when the Inca did dominate and thrive in these areas that they would be doing similar to us, and undertaking the various rituals they chose to participate in within their culture to connect with the gods in this realm. It was very mystical, and awe inspiring knowing that there had been thousands of years of generations who had mastered the skills of harnessing the limestone, creating amazing shapes, seating, working with the sun, the moon and shadows using their knowledge of astronomy to work with how the light would enter the cave against the stones creating beautiful shadows, or reverse, illuminating the shadowy spaces, and with a purpose. As I crawled through the tight spaces I had that fear creep in “Tristan, you are in South America. What if a nasty bug bites you and then you get stuck?”. For some reason I still felt very safe, it felt peaceful, I was at ease and it was not claustrophobic in any way. Deep down I knew everything would be okay. 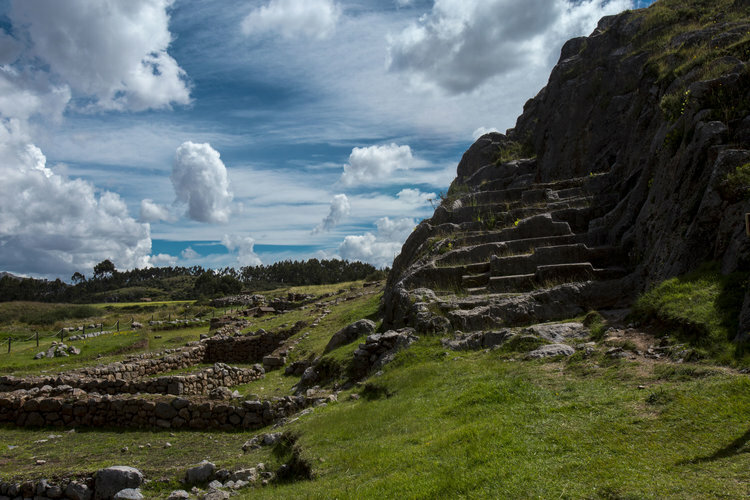 The caves were known for when the Incas extracted blocks of this area for the construction of the fortress temple complex Sacsayhuaman or Saksaqwaman (Quechua meaning Royal Falcon, although some people will say Royal Eagle depending who you ask). It is one of those moments again where I am thinking how the heck have they managed to cut the stones perfectly with fine straight edges and corners considering the technology that wouldn't have been available during their era, and thinking of the options they had. Bear in mind that I am still exploring the caves looking for another way back. I can no longer hear Gary, so I am either getting closer and he is hiding somewhere waiting to scare me, or I am totally lost. The silence in the cave is not at all eerie, it is very zen and I am starting to really feel how special these caves are. That feeling of being in a room with no distractions, just warm sensations, peacefulness and tranquility all washing over me, whilst being present and in the moment... yet also so strangely connected to the past of this amazing place. These caves were also known for the Incan rituals that occurred within, with the inside areas consisting of throne like seats, altar like structures and many narrow passageways which I am still exploring. I don't know where time has gone, I have not forgotten about Gary and I am sure he hasn't forgotten about me, but maybe he is experiencing the same thing as me. We are on an almost completely different timeline. I can see a seat inside a narrow passageway and I have to turn my body sideways to slide through the narrow crack. I am now sitting on this ancient perfectly carved rock with nothing but complete silence. I cross my legs, shut my eyes and let everything be as if I am not even here. Losing myself in this moment, or finding myself in this moment. No desire to go anywhere but here and now. I feel that to experience an enlightenment and a fulfilling life, inspiring, and raising awareness, then I as a human must be able to be in the now. We learn from the past (especially our ancestors), we are inspired by the future and we meet elements of both in the now and transform ourselves, our lives and even the lives of others here. The now is where we learn the most about ourselves and everything around us, that's why we must just stop at times, no distractions and just let ourselves be in this moment. This consciousness of just being, letting things flow, acknowledging and learning naturally, with a desire to grow and reaching my fullest potential, I am right in the now. This cave is showing and letting me feel its magic. I don't quite understand the feelings that are rushing through me or what it was I was experiencing but I feel very calm and content. The thought comes in that I need to go searching for Gary, time has disappeared. I have no idea how long I have been away and interestingly I have not heard one sound of the outside world. I gradually make my way back finding a passageway leading me to the opposite end of where I had left the original cave with our bags. Gary is sitting chuckling to himself smoking a mapacho softly saying “ I'm guessing the caves showed you their magic”. He admitted having a similar experience which was very strange. Some may say it was in our heads, but for me it all felt too real. We looked at the time and we had been in the caves for roughly 6 hours. We had originally only planned to be there for 2 hours max, so the magic in there definitely cast a spell over us and made time almost non existent. My first experience in Peruvian caves definitely did not disappoint. The moment I arrived in Calca, one mountain captured my attention almost immediately, Ancasmarca or as it is more commonly known Pitusiray, sitting at a height of 4,991m. I knew deep down that I had to climb this, there was no question of it, it had to be done especially as I was yet to climb a mountain in the Sacred Valley. The only things that concerned me were the high altitude and the weather. It had been nice during the days, rainy season had ended, but being that high the climate is always different and the weather can alter dramatically. We had gotten up at 4am, it was going to be a very earlier start and I wanted to make sure that I had time to meditate starting the day off right, then collect supplies from the market getting all the essentials for our trek up Pitusiray. Gary, my Scottish friend had decided to adventure up the mountain with me and I was chuffed about this as it can be nice having company on new adventures sharing the experience. We headed to the market and of all the people we could bump into, we bump into our friend The Shaman again, who we did the San Pedro ceremony with. He was getting some herbs and spices to treat a family member who had fallen sick. We were sad to hear that one of his family members had fallen ill. Even a man whose role and main duty was within his community in the jungle, family is always a priority and he would always be there to treat and help those however he could, even when they got sick in the more so-called “civilised areas” outside of the jungle. He quickly changed the subject making us laugh saying in Spanish to Gary who translated it “Won't be any problem camping on Pitusiray, you're men who like to wear a skirt in the hills”. He was being cheeky but kindly, meaning the Scots are tough and they don't need to wear much already. I really grew to like this man for the short time that I had known him, he was brave, kind, he had a funny and witty sense of humour and overall had amazingly positive vibes. As we left our friend The Shaman, we gathered all of our essentials, bananas, nuts, water, corn, bread and probably enough cake to feed 10 men. I'm blaming Gary for all the cake, as he had his favourite older sweet Quechua ladies in the market that he would talk to on a regular basis who were all very kind and always smiling. He made a point of telling them that we were going up the big mountain, and in return they filled our bags generously only wanting a big hug and a kiss on the cheek. Going up the mountains is treated like making a journey to converse with the gods. I had a feeling deep down inside me that it was going to be a night with no sleep, high above the clouds looking at the stars. The trek definitely was not easy. The first hour I find is always the toughest before you get into a rhythm, breathing starts to get in sync, your body starts to adjust, then things starts to flow easier. But on the other hand Gary was also having a bit of a tough time, as his backpack was almost double the size of him. I kept offering to help but his stubbornness would kick in with him refusing any help, so we decided to take breaks every half and hour which didn't bother me as the views were remarkable, plus we always had the most intense deep conversations about everything. Gary was full of stories. As we hit about 4,500m, we were starting to get above the clouds. Unfortunately, I was now starting to feel the slight effects of altitude. My head was feeling a little wonky and I had totally forgotten to buy the most important thing I could have bought, the coco leaves of all things, to help with the altitude. Luckily as we continued up the mountain we saw this old man coming down it chewing something that I knew had to be coco leaves. I kindly asked if he could spare some, and he generously and gladly offered me two handfuls. After a few minutes chatting we made our way back on track, my headache was now feeling better and I was now feeling more energised and truly grateful for that old man sharing his coco leaves with me. Coco leaves don't taste amazing, but god do they help with altitude and give you a small kick of energy. Natures medicine. We had been trekking roughly 6 hours from Calca 2,928m almost making it to the top when we had caught up with another old man. At first I thought it was the old man that we had met before, but then I thought surely it couldn't have been. For a second Gary and I were both very confused, but it was not the same man, it was another who was carrying a piece of firewood which looked far too heavy for a man of his age to be carrying. As we slowly passed him he stuck out his foot and tripped me up letting out the loudest roar of a laugh, we all started laughing. I had no idea what had just happened, well I did, he obviously tripped me up on purpose but it was comical and again the Peruvian elders have a funny sense of humour. He was a true man of the mountains, that I could tell, even though I could not understand one word that he said. Gary couldn't even understand any words that he was saying. He was talking in another language or mumbling Quechua in a dialect Gary had not heard before. Then all of a sudden it was as if the old man came to terms with the fact that we couldn't understand him, and he sat down on a rock. We sat down next to him, then for the next thirty minutes or so, we just sat there staring into the distance, before the old man got up and smiled, nodded off then away he went on the rest of his journey. It was a very beautiful moment, no words were said in that time but we had a mutual understanding that went beyond language, just being and admiring the view. This is one reason why I love adventuring, moments like these are precious. We finally made it to the top of Pitusiray 4,991m. My God the views were insane. It was gorgeous, so peaceful and exactly where I felt I needed to be in that exact moment. We had wanted to camp on the top but it was too dangerous. It looked as if we were going to get hit by a thunder storm, so we retreated down the mountain finding a small cave, flat land, spongy tall grass and a tree with enough twigs on it to man a small fire. We luckily escaped the thunderstorm hiding in the cave for a few hours, just like the ancestors of this land would have done. The night ended with us both passing out in front of our small fire looking up gazing at the stars. My trip was now coming to an end. 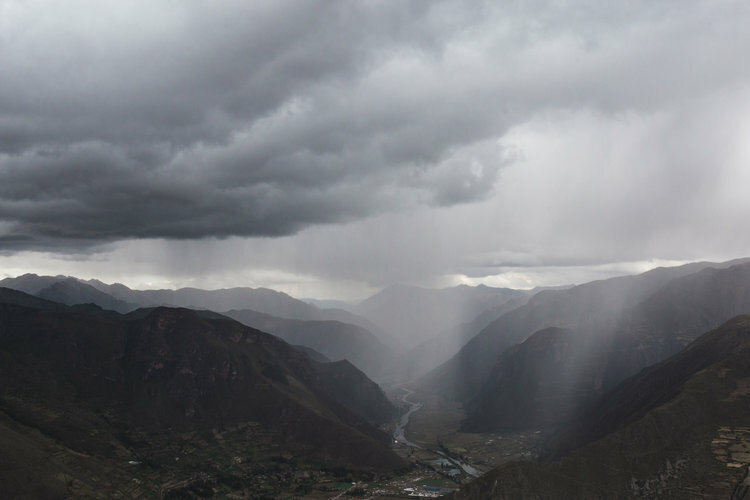 I had been given a true insight of Peru, how special it is and how fortunate I had been to visit. It had been a one in a life time experience for me, one that I had wanted to fulfil for a long time, and will never ever be forgotten. I met many like minded souls all on their own unique inspiring journey and I won't forget what I have learned during my stay. I will return. I hope that if you are considering visiting Peru that reading this might help give you that push to take the jump like I did, you won't regret it. I also look forward to sharing more stories of my journeys to amazing places with you all.